The Starbucks Verismo machine can make both espresso beverages and brewed coffee. NEW YORK (CNNMoney) -- Starbucks unveiled its own single-cup home-brewing machine Thursday, sending shares of competitor Green Mountain Coffee Roasters reeling in after-hours trading. Starbucks will begin selling its "Verismo" machine this fall, the company said in a statement, which did not offer pricing information. Green Mountain currently dominates the single-serve market with its popular Keurig, or K-Cup, machines. Last year, the two companies announced a deal allowing Green Mountain to produce K-Cup versions of Starbucks coffees and Tazo teas. With the Verismo, however, Starbucks is moving into single-cup brewing for itself, partnering with Germany-based Krueger GmbH & Co. KG to produce the machine. "The premium single-cup segment is the fastest-growing business within the global coffee industry," Starbucks CEO Howard Schultz said in a statement. "We have long believed that the biggest prize within the segment is a high-pressure system that would give us the opportunity to deliver Starbucks-quality espresso beverages at home and at work for customers who desire the Starbucks espresso experience outside of our stores." Shares of Green Mountain (GMCR) were down more than 20% late Thursday, dipping below $49 after closing at $62.40. 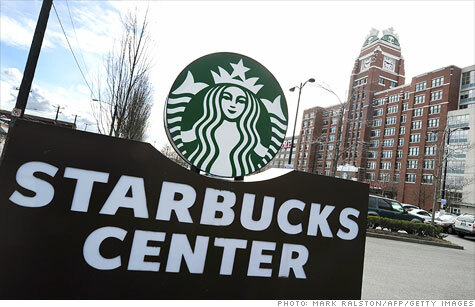 Starbucks (SBUX, Fortune 500) was up more than 3% after-hours, after closing at an all-time high of $50.37. Starbucks gave no indication that it would dissolve the existing agreement with Green Mountain. Starbucks said that it shipped over 100 million K-Cup packs in the eight weeks following last year's launch, and that the Starbucks K-Cup business "continues to accelerate." "This is complementary to our partnership with Green Mountain, and they can and they will co-exist," Schultz said in a call with analysts. Schultz noted that the K-Cup brews coffee in a low-pressure machine, while the Verismo will also offer espresso-based drinks. Representatives of Green Mountain did not immediately respond to a request for comment Thursday.